This Web site is offered by Search Seminars International (“SSI”) to the user conditioned on acceptance by the user (“User”)without modification of the terms, conditions, and notices contained herein. By accessing and using this Web site, the Useris deemed to have agreed to all such terms, conditions, and notices (the “Agreement”). Areas in this Web Site deemed “Public” are areas accessible to any user and do not require a username and password. Public areas of this Web site are for the User’s personal, non-commercial use. User may not modify, copy, distribute, transmit, display, perform, reproduce, publish, license, create derivative works from, transfer, or sell any information, software, products or services obtained from this Web site, available now or at any time in the future. Product information may be printed on User’s personal printer for personal use. THE INFORMATION PUBLISHED ON THIS WEB SITE MAY INCLUDE INACCURACIES OR TYPOGRAPHICAL ERRORS. CHANGES ARE PERIODICALLY ADDED TO THE INFORMATION HEREIN. SSI AND/OR ITS RESPECTIVE SUPPLIERS, INCLUDING BUT NOT LIMITED TO ABROHN DESIGN STUDIOS, MAY MAKE IMPROVEMENTS AND/OR CHANGES IN THIS WEB SITE AT ANY TIME AT THE SOLE DISCRETION OF SSI. SSI, AND/OR ITS SUPPLIERS MAKE NO REPRESENTATIONS ABOUT THE SUITABILITY OF THE INFORMATION CONTAINED ON THIS WEB SITE FOR ANY PURPOSE. IN NO EVENT SHALL SSI AND/OR ITS RESPECTIVE SUPPLIERS BE LIABLE FOR ANY DIRECT, INDIRECT, PUNITIVE, INCIDENTAL, SPECIAL OR CONSEQUENTIAL DAMAGES ARISING OUT OF OR IN ANY WAY CONNECTED WITH THE USE OF THIS WEB SITE OR WITH THE DELAY OR INABILITY TO USE THIS WEB SITE, OR FOR ANY INFORMATION OBTAINED THROUGH THIS WEB SITE, OR OTHERWISE ARISING OUT OF THE USE OF THIS WEB SITE, WHETHER BASED ON CONTRACT, TORT, STRICT LIABILITY OR OTHERWISE, EVEN IF SSI AND/OR ANY OF ITS SUPPLIERS HAS BEEN ADVISED OF THE POSSIBILITY OF DAMAGES. BECAUSE SOME STATES/JURISDICTIONS DO NOT ALLOW THE EXCLUSION OR LIMITATION OF LIABILITY FOR CONSEQUENTIAL OR INCIDENTAL DAMAGES, THE ABOVE LIMITATION MAY NOT APPLY TO YOU. As a condition of use of this Web site, User warrants to SSI that User will not use the Web site for any purpose that is unlawful or prohibited by these terms, conditions, and notices. hyperlinks to such Web sites does not imply any endorsement of the material on such Web sites or any association with their operators. Publish, distribute or disseminate any defamatory, infringing, obscene, indecent or unlawful material or information. Upload files that contain software or other material protected by intellectual property laws (or by rights of privacy of publicity) unless the User owns or controls the rights thereto or has received all necessary consents. Advertise or offer to sell any goods or services, or engage in surveys, contests, or chain letters. Download any file that the User knows, or reasonably should know, cannot be legally distributed via this Web site. User agrees (as available) to send and receive electronic mail and otherwise use this Web site only as permitted by theseterms and conditions, any additional policies or procedures published in this Web site from time to time by SSI, and applicable law. The User acknowledges that emails and any other such communications forms hosted by this Web site are public and not private communications. SSI reserves the right to deny in its sole discretion any user access to this Web site or any portion thereof without notice. SSI reserves the right to edit any notices for clarity and length. Any software (“Software”) that is made available to download from this Web site is the copyrighted work of SSI, Macromedia, Inc., Adobe Systems, Inc. and/or their suppliers. Use of the Software is governed by the terms of the end user license agreement, if any, which accompanies or is included with the Software (“License Agreement”). End users shall not install or use any Software that is accompanied by or includes a License Agreement, unless the end user first agrees to the License Agreement terms. For any Software not accompanied by a license agreement, the following shall constitute the License Agreement: SSI, Macromedia, Inc., Adobe Systems, Inc. and/or their suppliers hereby grant to the User a personal, nontransferable license to use the Software for viewing and otherwise using this Web site in accordance with these terms and conditions, and for no other purpose. Please note that all HTML, asp, or other code contained in this Web site, is owned by SSI and/or its suppliers and is protected by copyright laws and international treaty provisions. Any reproduction or redistribution of the Software is expressly prohibited by law, and may result in severe civil and criminal penalties. Violators will be prosecuted to the maximum extent possible. 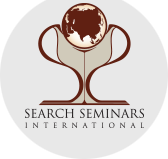 Contact support@searchseminars.org with questions or problems with this web site. SSI reserves the right to change this Agreement at any time by revising the terms and conditions herein. User is responsible for regularly reviewing these terms and conditions. Continued use of this Web site following any such changes shall constitute the User’s acceptance of such changes. This Agreement shall be deemed to include all other notices, policies, disclaimers, and other terms contained in this web site; provided, however, that in the event of a conflict between such other terms and the terms of this Agreement, the terms of this Agreement shall control. This agreement shall be deemed to have been made in the State of North Carolina, U.S.A. and shall be interpreted, and the rights and liabilities of the parties hereto determined in accordance with the law of the State of North Carolina, U.S.A., without regard to conflicts of law principles. The parties consent to the exclusive jurisdiction of the state and federal courts for the County of Hendersonville, North Carolina, U.S.A. for the determination of any claim or controversy between the parties and arising out of or relating to this Agreement. Both parties hereby consent to the jurisdiction of the Ohio courts and waive any objections as to personal jurisdiction or as to the laying of venue in such courts due to inconvenient forum or any other basis. User acknowledges that no joint venture, partnership, employment, or agency relationship exists between the User and SSI as a result of this Agreement or use of this Web site. User agrees not to hold himself or herself out as a representative, agent, or employee of SSI and SSI shall not be liable for any representation, act or omission of the User. SSI’ performance of this Agreement is subject to existing laws and legal process, and nothing contained in this Agreement is in derogation of SSI’ right to comply with law enforcement requests or requirements relating to the User’s use of this Web site or information provided to or gathered by SSI with respect to such use. If any part of this Agreement is determined to be invalid or unenforceable pursuant to applicable law including, but not limited to, the warranty disclaimers and liability limitations set forth above, then the invalid or unenforceable provision will be deemed superseded by a valid, enforceable provision that most closely matches the intent of the original provision and the remainder of the Agreement shall continue in effect. This Agreement constitutes the entire agreement between the User and SSI with respect to this Web site and it supersedes all prior or contemporaneous communications and proposals, whether electronic, oral or written, between the User and SSI with respect to this Web site. A printed version of this Agreement and of any notice given in electronic form will be admissible in judicial or administrative proceedings based upon or relating to this Agreement to the same extent and subject to the same conditions as other business documents and records originally generated and maintained in printed form. As a condition of use of this Web site, the User agrees to indemnify SSI and its suppliers from and against any and all liabilities, expenses (including attorneys’ fees) and damages arising out of claims resulting from User’s use of this Web site, including without limitation any claims alleging facts that if true would constitute a breach by User of these terms and conditions.